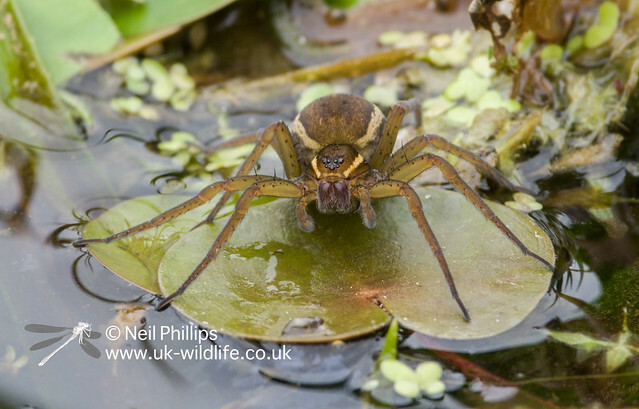 This year I decided that I needed to get some good shots of raft spiders, the largest spider species found in the UK. 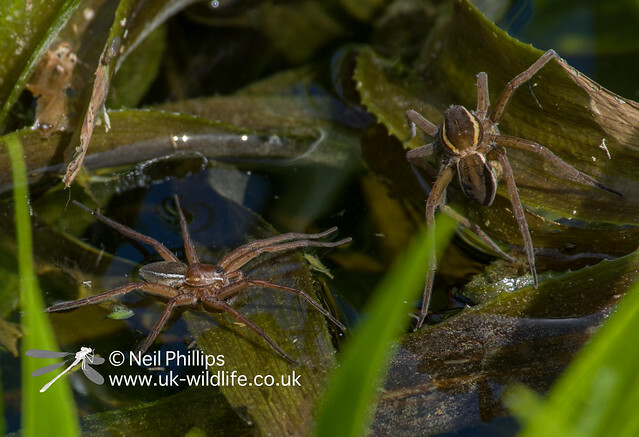 Unfortunately living in Essex there are no sites nearby, the closest good site I’m aware of being Thursley Common in Surrey, where the Bog Raft Spider Dolomedes fimbriatus can be found. A visit at the start of June did not result in any sightings, let alone photos, but I decided to try again later in the year. Later in June I had booked a few days off so I could visit the Norfolk Broads and Suffolk Fens. On the first day I visited RSPB Strumpshaw Fen, which I blogged about previously. 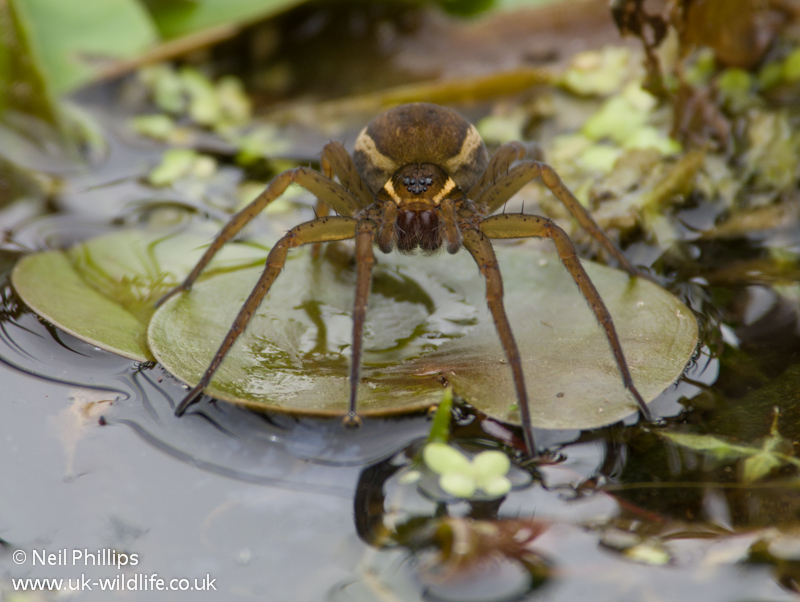 On the second day I went looking for the rare and protected fen raft spider. 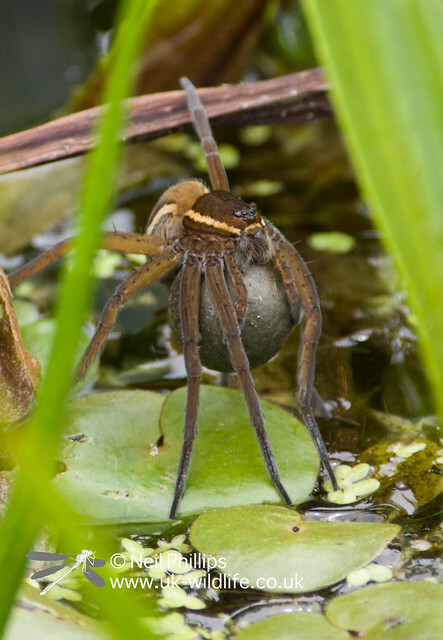 This species is credited with being the largest spider in the UK and was until recently was restricted to just 3 sites in the UK (on some of which they were struggling), but a captive breeding and relocation programme combined with habitat improvements has helped increase both their number of sites and population of the species in the UK. 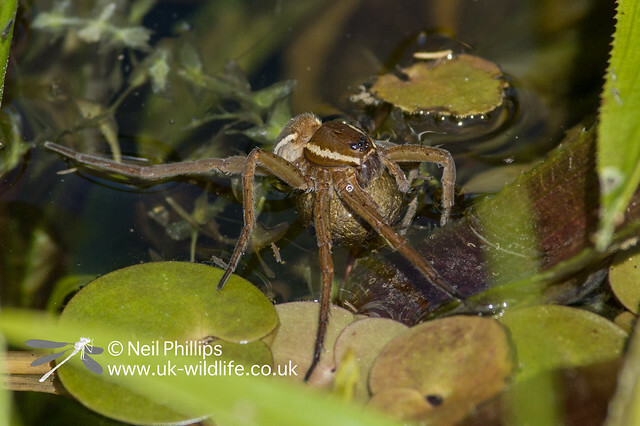 I met up with Helen Smith, who played a key part in the species conservation programme, breeding and rearing 100s of fen raft spiders Dolomedes plantarius in her kitchen as part of the reintroduction programme and is an expert on this rare and protected species. She took me to Castle Marshes, one of the sites where they were introduced a few years ago, and despite the overcast weather, there were plenty to be seen. I spotted the first one in a plant at the edge of one of the ditches, a small juvenile. 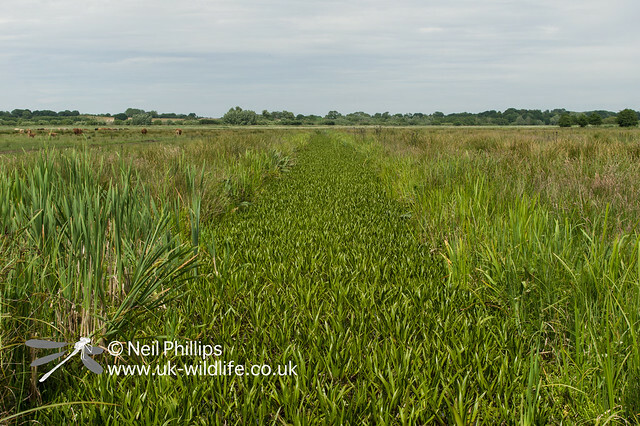 The ditches were crammed with water solider, ideal habitat for this species to live and breed. 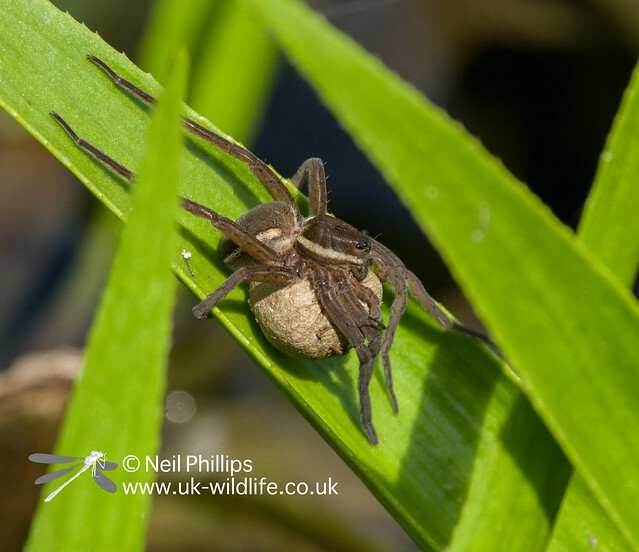 In one area there were a couple of females, one of which was demonstrating what fantastic parents they are, carrying her egg cocoons in here fangs. She will carry this egg cocoon until they are ready to hatch, basking in the sun to warm it up and dunking it in water when needed to keep the eggs suitably moist. This female was obviously full of eggs. The sun eventually started to peer out from behind the cloud and few females started emerging with their egg cocoons. 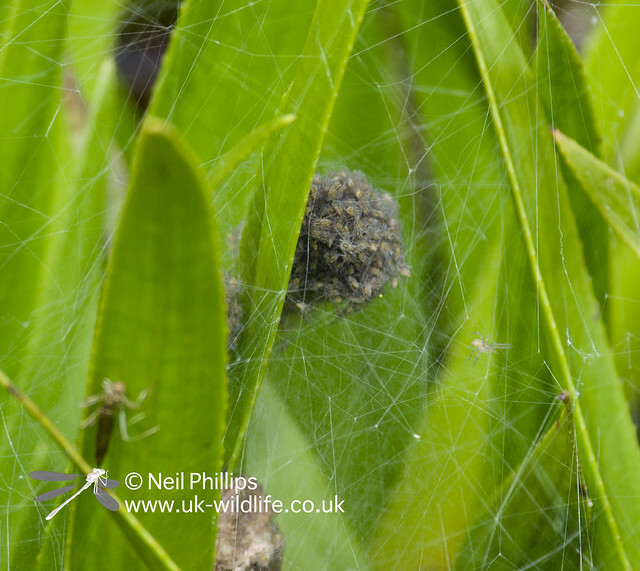 When the eggs hatch and the spiderlings in the egg cocoons are ready to emerge, the female spins a nursery web for them to live in for the first part of their lives, where she guards them until they are ready to disperse. 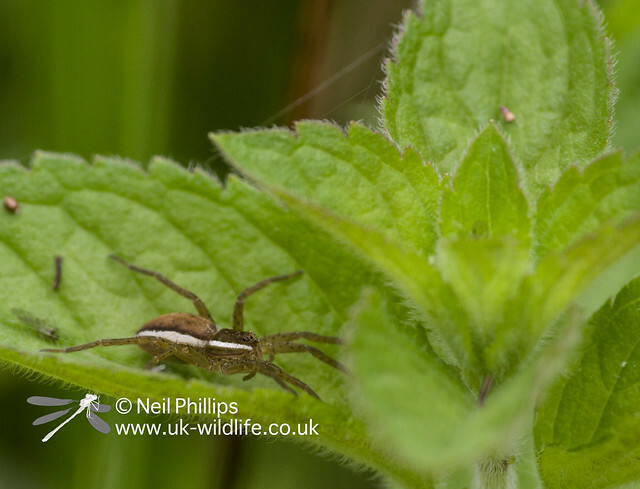 I visited in late June as normally the water soldier would have been full of nursery webs, but sadly the weather in spring seemed to have delayed things somewhat and only 1 nursery web could be found with a small clump of spiderlings in the middle. During my visit I recorded some video clips, which I have edited together to make this short film. This includes footage of the male attempting to court the female and other males trying to beat him too her!